I have a report on a particular kind of negative astral entity. I would call it a Thief of the Third-Eye Point Light. They’re about as big as a man would be … a man five or six feet tall. But their energy field is denser than that of a man on the astral plane. They have an attraction to the third-eye point light of human beings, on the astral plane. They want to take it away from us, and they want it for themselves. You know, there are beings of different kinds on the astral plane. And amongst the beings that are negatively aspected, there are beings that are relatively dark, and those that are relatively light. Those that are light, sometimes steal light from other beings. And so, when we say prayers, we make a distinction between the ‘beings of light’, and the ‘beings of light and love’ … or ‘beings of light and Christed love’, you see. Because the type of beings that we want to have around us … that can nourish our physical and subtle bodies, and help us align with God, are the beings of ‘Christed love and light’ or ‘light and Christed love’. Getting back to this being … the Thief of the Third-Eye Point Light … They come and pester me sometimes. Because people who do kundalini yoga develop a reasonably strong third-eye point light, along with the light of the other chakras. And so, they come, and they are attracted to the light. Lots of different kinds of beings are; but this particular being is a bother. So it was hanging around last night. They tend to come around at night, when I’m tired; when my energy field is a little lower. So that’s something to look out for. The notion being, to enjoy life, and to have a nice, relaxed time in the evenings, when we’re tired, so as to prevent these types of negative astral entities from coming around. Anyway, it was coming around, insistently, last night, while I was working on the computer. It was around my head, and above my head. You know, there are people on Earth who have the malware that they are frightened of the third-eye point light of other people. And so … because of this superstition of the evil eye that some country folk have … they’re in alignment with these Thieves of the Third-Eye Point Light. So these people can be used by those Thieves to help steal the light of other human beings perceived by the superstitious human beings as being a threat to them when, in fact, they are not. The third-eye point light is merely the light of a strongly functioning pituitary gland … and also the door that helps us see the door amongst the various multidimensional and multitemporal worlds. So, it’s not a threat to other people unless it’s negatively aspected. And it’s not negatively aspected unless we’re in poor health, or our kundalini is not properly aligned … we’re not doing the right kind of stretching and yoga and joyful participation in this third-dimensional reality. Or, unless someone is attacking us. Someone who is superstitious about the third-eye point … someone who thinks that we have the evil eye, or who is fearful of our third-eye point, can join up with one of the Thieves of the Third-Eye Point energy, and attack us. And so then, things happen to our third-eye point, so that we have to keep doing our yoga, over and over again, and all the other practices that are important for a happy energy field, a healthy aura. Anyway, getting back to the topic, last night, I thought of someone that had this notion that he was other people’s … especially women’s … third-eye points … thought they were the evil eye. And the minute I thought about that person, this beings that was hunched and crouched over me, trying to get at my third-eye point … which is a bother … leaped off of me! … and sprang through the air, for a long way … hundreds of miles! … to this other person. All in a trice! All in an instant! The energy that I gathered from that other being (the one that leapt) was like a movie that I saw a time or two .. It’s called the Time Machine, the 2002 film, (1) about a person … not in this century; in a prior century … that made a time machine, and was hoping to get back to the lady that he loved, and who had passed on, I think. And he made a mistake, and he went forward in time … oh, you know, way, way forward in time … to a time when there had been a catastrophic explosion of the Moon, and it had changed the population and animal life and everything on Earth. And all the sentient life, mostly, was three different species. pr races. of beings evolved from today’s human beings … One, the Eloi, that was sort of like cows or cattle. And another, the Morlocks, that preyed upon the cows or cattle. And then there was the Uber Morlock, a humanoid Morlock (2) … who was an overlord or overseer, with a really strong third-eye point. Actually, I saw something in that movie, which made me watch it a time or two. And especially, the people that were so docile, and easily caught and marauded and eaten by this predatory race that was once human, and the third-eye point overlord. have some bearing on the current reality, I feel. And now, since that experience last night, I have a couple of things to say about that movie. The predators in that movie had this immense leaping ability … they could make giant leaps. (3) They were very, very strong; very, very fierce. And they they lacked a human feeling … a heart-felt feeling. And the being that jumped off of me last night had a similar, predatory springing ability … a strength … about him. And also some of the third-eye point energy of the uber-morlock overseer in the movie. But he was not a Controller … it was more like a medium-range astral entity of the negative astral entity series. So anyway, I do notice, quite a bit, attempts … spells and so forth … to dumb down my third-eye point … or to injure it. And I came up with a prayer today, and a blessing for the third-eye point, that I think would be good for everybody, as they begin to develop the sensitivity to that. and to understand the importance of keeping the third-eye point clear. 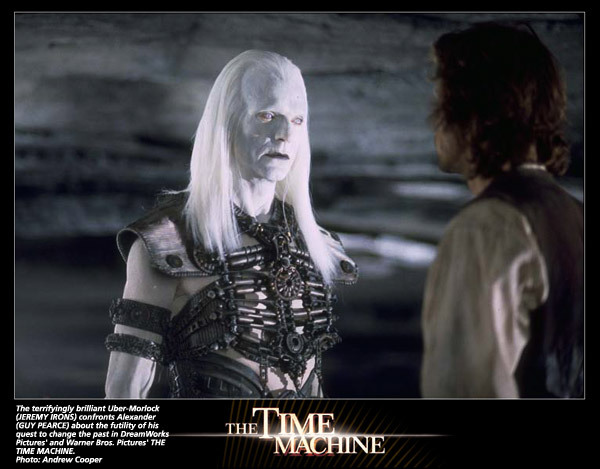 Link: “The Time Machine (2002 Film), in Wikipedia, https://en.wikipedia.org/wiki/The_Time_Machine_(2002_film) ..
(2) Image: Uber Morlock, http://maggot.dieplz.net/Uber-morlock/gallery12.jpg ..
Video: “The Time Machine (4/8) Movie CLIP – The Morlocks (2002) HD,” by Movieclips, 17 May 2012, https://www.youtube.com/watch?v=2KGv86GLvXo ..
Video: “Jurassic Park (1993) – Raptors in the Kitchen Scene (9/10) | Movieclips,” by Movieclips, 27 May 2011, https://www.youtube.com/watch?v=dnRxQ3dcaQk .. This entry was posted in 6th chakra - third-eye point, Anxiety - fear - panic attacks - fight or flight - cognitive dissonance - mental turmoil, Ascension team, Dimensions - multidimensionality - veils, Evil eye, Health - healing, Malware - malspeak - implants, Prayers - blessings - mantras - affirmations - white magic, Prayers by Alice, Timelines - multitemporality - alternate universes - fractals, Yoga and tagged "Time Machine" movie, ascension team, beings of light, beings of light and Christed love, beings of light and love, Chakras, dimensions, Endocrine system, Evil eye, fear, health, kundalini yoga, malware, multidimensionality, multitemporality, negative astral entities, pituitary gland, prayers, Prayers by Alice, sixth chakra, Spells, superstition, third eye-point, timelines on 12 March 2018 by Alice B. Clagett.